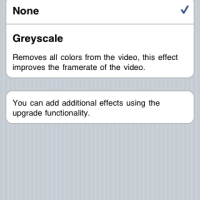 One of the new features of the iPhone 3GS was an improved camera with video recording. For a while it was thought that only the iPhone 3GS could take video but soon enough video camera apps began to appear in the App Store for the iPhone 3G and even the Original iPhone! 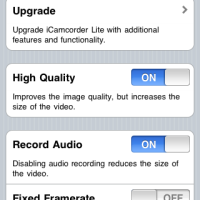 One of the apps that brought video camera capability to the Original iPhone is called “iCamcorder”. Normally available for $1.99, there is now a great lite (free) version for users to try. 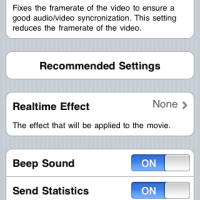 iCamcorder Lite is identical to the full version except that the recording time is limited to 15 seconds per video and only one of the eleven effects is included. To remove the restrictions, users can use in-app purchase to upgrade the app. Users can further download two different video effects packs through the app ($0.99/each) which include new effects such as Old Movie Effect, Super 8, Motions Trails, Inverted Colors, Bloom, Mirror, Quad Cam, Pop Art, Color Flip, and Multi View. The app does not have to be used exclusively with the Original iPhone, as it works great with the iPhone 3G as well. The app records video in either portrait or landscape and at 15fps with available digital zoom of 1x, 2x, and 4x. While shooting videos, the videos are encoded during the recording process, which saves a lot of time. 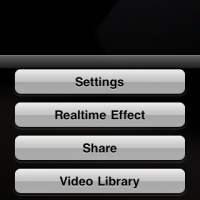 iCamcorder then allows users to quickly share their completed videos on Facebook, Twitter, or YouTube. Videos may also be sent via email. iCamcorder is available in the App Store for $1.99. There is also lite version available for free.